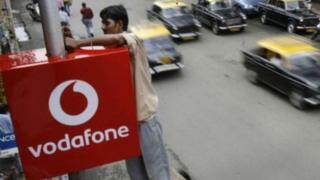 India's tax department has sent a renewed tax notice of $2.1bn (£1.4bn) to telecom giant Vodafone. The firm has been told that its assets would be seized in case it failed to pay the tax. Vodafone has been fighting Indian tax authorities since its 2007 takeover of Hong Kong-based Hutchison Whampoa's Indian mobile unit for $11bn. The company has said that it doesn't owe any taxes in India because the transaction was conducted offshore. Correspondents say that the income tax department's notice to Vodafone has again raked up the controversial retrospective taxation. India's top court ruled in favour of Vodafone in 2012, but the government changed laws later that year to allow firms to be taxed retrospectively. The move was heavily criticised by investors at the time. But since coming to power in May 2014, Prime Minister Narendra Modi and Finance Minister Arun Jaitley have repeatedly assured foreign investors of a stable tax regime. In a strongly worded statement, Vodafone said India had promised that tax disputes "would be resolved through existing judicial process". "In a week when Prime Minister [Narendra] Modi is promoting a tax-friendly environment for foreign investors [through Make in India week] - this seems a complete disconnect between government and the tax department," it said.